Entering Casa Galilei for the first time is an experience in itself. Like most of the buildings in Capena’s old quarter, it backs onto the living rock. This is evident immediately when you descend the stairs and come face to face with a cave dating back to Etruscan times! After this dramatic introduction, the space opens up to a roomy apartment over two floors facing west over a wooded valley (where you can glimpse the entrances to more caves, like those shown below). Because of its rocky back, all the windows and views are on the west side of the building and light is funnelled into the innermost rooms by a clever system of skylights and openings cut into the metre thick walls. In addition to the entrance cave, Casa Galilei has two more caves, one is accessible through a door at the foot of a stairway near the laundry area and the other is sealed off but can be seen through a glass door. All the caves bear the signs of hand-working that is probably thousands of years old. 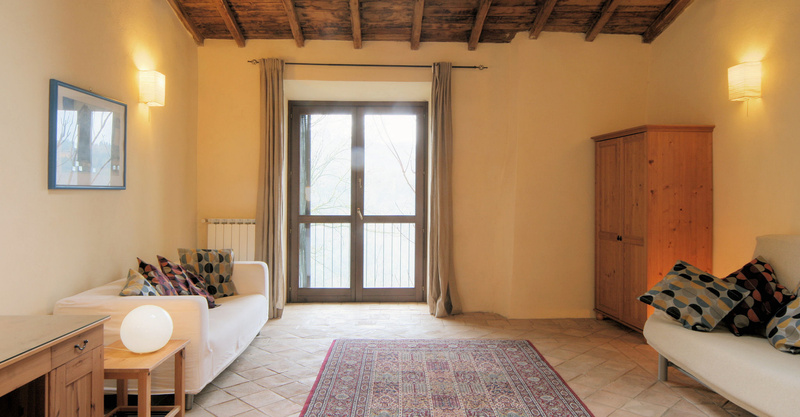 The apartment (formerly the monastery’s guest quarters) has recently been fully restored, using hand-​​fired terracotta tiles and chestnut beams that would have been familiar to its original residents. 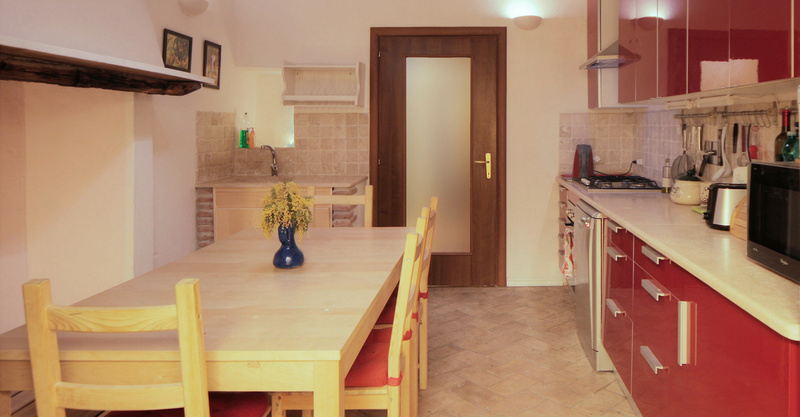 Despite its antiquity, the apartment is now comfortably equipped with everything the present-​​day traveller could desire including central heating, washing machine, drier, dishwasher, wi-​​fi and Sky TV. Casa Galilei sleeps six in the three permanent bedrooms or eight if the sofa bed in the second lounge is used as a double bed (this option still offers plenty of communal room in the main lounge, shown below left). It also has two bathrooms, one of which is ensuite and the other is shown below right. At a stretch, the house can also accom­modate two extra people on the single futons in the downstairs bedrooms, thus offering a total of ten sleeping places. Babies are welcome and the apartment is equipped with a cot, high chair and baby bath. We also have stair-gates if required. Large lounge (5m x 7m) with three sofas and Sky TV. Master bedroom and ensuite bathroom with floor length windows overlooking the valley. Contains wardrobe and chest of drawers. Second lounge/​​bedroom 2/​​study (5m x 5m) with a sofa and sofabed, desk printer and wi‑fi – plus floor length windows overlooking the valley. The room faces west with wonderful sunset views. Laundry room (marked as ‘Store’ on the floor plan) with washing machine, sink, vacuum cleaner and other cleaning aids. Three small grottos, handcarved from the tuff thousands of years ago by the original Etruscan residents of the Rocca. Two of the caves are closed off by doors, while the other (marked as the ‘Cantina’ on the floor plan) is located in the house’s entrance area. Bedroom 3 (4 x 5m) with two single beds plus one futon bed and wardrobe. Floor length windows overlooking the valley. Bedroom 4 (5 x 5 m) with two single beds plus one futon bed and wardrobe. Floor length windows overlooking the valley. External door, giving onto a stone staircase leading down to the exterior ground level. Bathroom with shower, wc, sink, bidet. Bed linen and towels, washing machine, dishwasher, Sky TV, DVD players, wi-​​fi internet, microwave, gas oven with gas hob, fridge-​​freezer, cot, high chair, iron, ironing board, hair drier, vacuum cleaner, tea/​coffee making equipment. In addition to the bathroom towels, beach towels are also provided for trips to the nearby pools, lakes or seaside. Other equipment includes a desk and printer, a large selection of books for all ages, including some maps and guidebooks, DVDs and toys. The table shows prices for week-​​long bookings. Discounts may be available for longer stays and the house is also available for shorter visits: see the small print below. To check Casa Galilei’s availability, click here. To read more about Casa Galilei, click here. 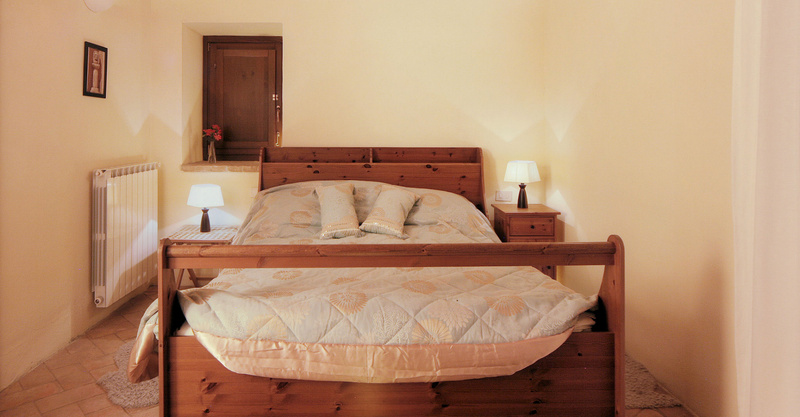 The house is also available for shorter stays (minimum 3 nights) at €90/night. Bed linen, towels and cleaning included in the price. €70 cleaning fee if the whole house is rented. 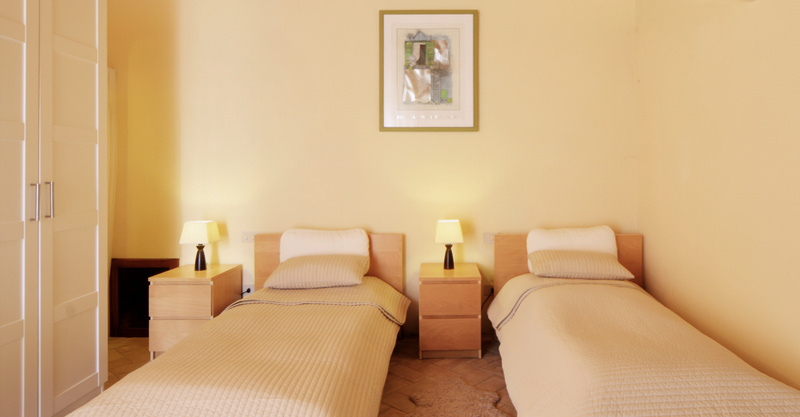 You can choose your preferred way to book your stay at Casa Galilei.